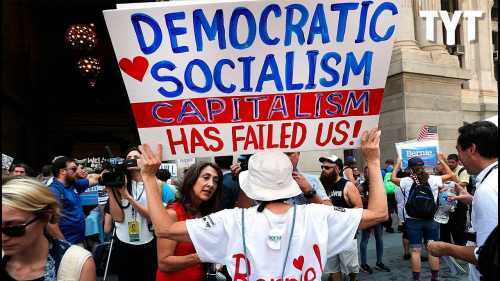 (Kaylee McGhee, Liberty Headlines) According to a poll released by Gallup on Monday, 57 percent of Democrats favor socialism while only 47 percent have a positive outlook on capitalism. In May, Hillary Clinton cited among her litany of reasons for losing the 2016 election that being a capitalist probably hurt her chances. Taking a cue from Clinton’s main primary opponent, Bernie Sanders, some Democratic politicians, like recently anointed New York congressional candidate Alexandria Ocasio-Cortez, have run on socialist platforms—with varying success. Ocasio-Cortez has said she believes in a “democratic socialist” society, meaning: Medicare for all, free public college, along with a variety of other extremely progressive policies. “I believe in health care for all, I believe in education for all, I believe in housing as a human right, and then if people are going to call me a socialist for believing in those things, alright, call me a socialist; I don’t give a d***,” she told Black Lives Matter activist DeRay Mckesson. In an appearance on “The View,” Ocasio-Cortez said she identifies as a socialist because income equality still exists in the U.S.